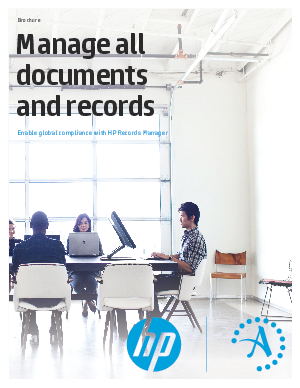 HP Records Manager delivers next-generation, scalable, electronic document and records management (EDRM) for enterprises across the globe. Built on more than 28 years of information management expertise, HP Records Manager is a comprehensive, out-of-the-box software solution that enables you to effectively manage documents and records, email, web content, images, video, and workflows—and provides document-centric collaboration capabilities. Download now to find out more .